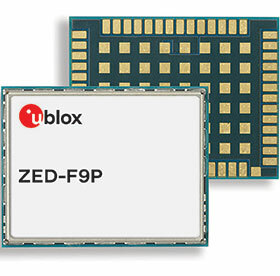 u-blox announced the ZED F9P multiband GNSS (global navigation satellite system) module with integrated multiband real-time kinematics (RTK) technology for machine control, ground robotic vehicles and high-precision unmanned aerial vehicles (UAV) applications. The module measures only 22 x 17 x 2,4 mm and uses technology from the recently débuted F9 platform to deliver robust, high-precision positioning performance in seconds. According to u-blox, the ZED F9P was the first mass market multiband receiver to concurrently use GNSS signals from all four GNSS constellations (GPS, GLONASS, Galileo and BeiDou). Combining GNSS signals from multiple frequency bands (L1/L2/L5) and RTK technology lets the module achieve centimetre-level accuracy in seconds. And receiving more satellite signals at any given time maximises the availability of this level of accuracy even in challenging environments such as in cities. With its high update rate, the ZED F9P is ideal for highly dynamic applications such as UAVs.